Schaumburg, Illinois (USA)-During the recent GIFA show in Duesseldorf, Germany, both Hunter Automated and its partner Maus reported successful exhibition of their machinery and related equipment. Sandra Selwan, marketing manager for Maus (Padua, Italy), said the booth traffic was excellent throughout the show and that many current and potential customers visited. At the booth, Maus displayed its SAM multi-axis grinding system for gate and riser removal on metal castings. Owing to the offline programming station and rotating worktable, the SAM system from Maus enables cost-effective and high production rates. Also present at the booth were managing director Roberto Sammartin, sales manager Claudio Cossalter and the new North American sales manager, Carlo Canevese. Maus markets its machinery and related systems through Hunter Automated in North America and other select regions globally. Meanwhile, at the Hunter (Schaumburg, Illinois-USA) booth, which was immediately adjacent to the Maus booth, activity was brisk throughout the event. 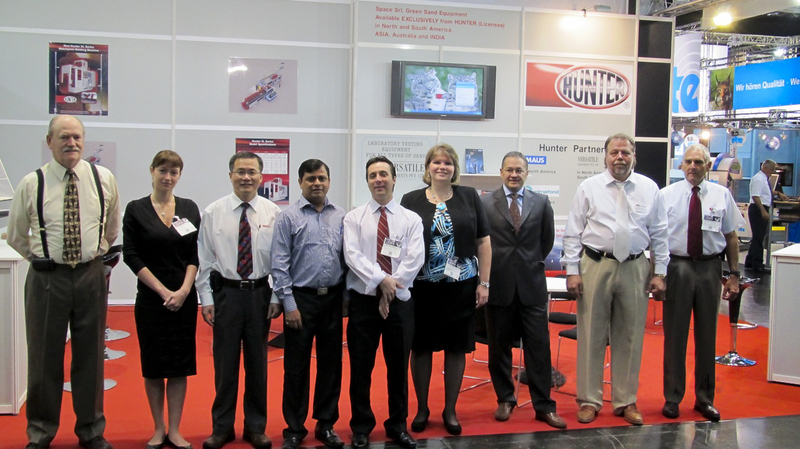 Hundreds of metalcasters from dozens of countries around the world visited and, in several cases, consummated deals with Hunter, the global leader in matchplate molding systems and mold handling lines for green sand casting. Working the booth were company president Bill Hunter, sales vp Kevin Purdy, sales manager Dean Martin and most of the global agent network Hunter, as well as representatives from the other manufacturing locations besides Chicago, namely, Brazil and China. As Purdy noted, “The strategy we’ve employed of manufacturing our machinery around the world, in key market areas for the foundry business, has proven both cost effective and customer-friendly.” Hunter also partners with Space’ and Versatile, all manufacturers of foundry equipment, in addition to Maus. During the show, Hunter also inked deals for other representatives in the global foundry market. Details of these new arrangements will be forthcoming shortly, according to Hunter management. 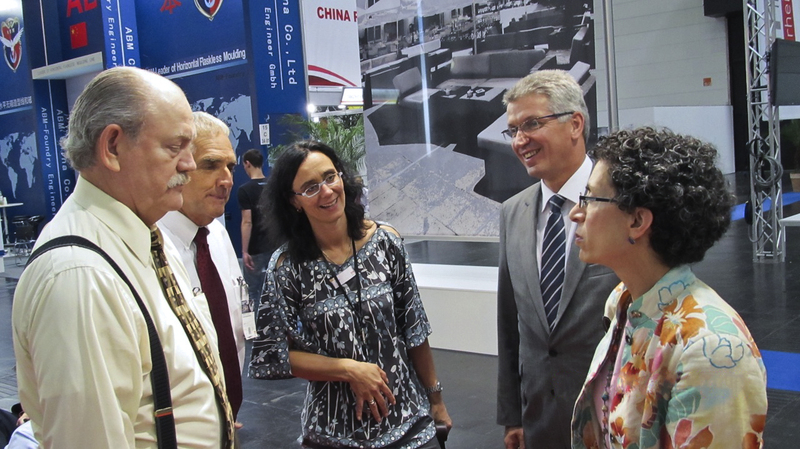 Also a show highlight at the Hunter booth, they welcomed Ms. Janice Weiner, U.S. Consul General, along with Klaus Jonas, Communications Specialist for the U.S. Department of Commerce and representatives from the Messe Duesseldorf show management team, Eva Rowe and Ryan Klemm. As announced at CastExpo 2010, just concluded in Orlando, Florida this week, Maus SpA (Padua, Italy) has signed an agreement with Hunter Automated Machinery Corporation (Schaumburg, Illinois) to represent the Maus line of grinding machines and related equipment to the foundry markets in the U.S., Canada and Australia, effective immediately. This announcement was made by Maus CEO, Roberto Sammartin, and Hunter President, Bill Hunter. Maus is a major supplier to the world foundry market of surface grinding and riser cutoff machinery, as well as automated work cells and complete transfer lines. The U.S. operation of Maus is based in Virginia Beach, Virginia. Hunter Automated Machinery is likewise a longtime leading supplier to the foundry market, having pioneered automated matchplate molding machinery for sand casters. Today, through various affiliate and representative agreements, Hunter also brings a broad line of automated mold handling, core resetters and sand prep testing equipment to foundries worldwide. Hunter operates facilities in the U.S., Brazil, China and Italy. For Maus, Hunter will provide sales and service representation, as well as test cutting and machine utilization studies for metalcasters, with an initial Maus grinding machine from the industry standard-setting SAM line installed in the Hunter headquarters, near Chicago. Maus will continue to supply technical assistance and application engineering from its existing Virginia Beach tech center.